Dr Ben Goldacre engages in online bullying and abuse and his BadScience forum is a notorious centre for some of what seem to be amongst the worst of the internet’s trolls, bullies and abusers. So when a troubled gentle soul takes his own life after years of bullying, abuse and harassment from some from Dr Ben Goldacre’s BadScience forum, Ben Goldacre bears a heavy responsibility. On Thursday August 15th 2013 after years of relentless online bullying, abuse and harassment from some of Dr Ben Goldacre’s BadScience forum members, family physician Dr Mark Struthers took his own life. 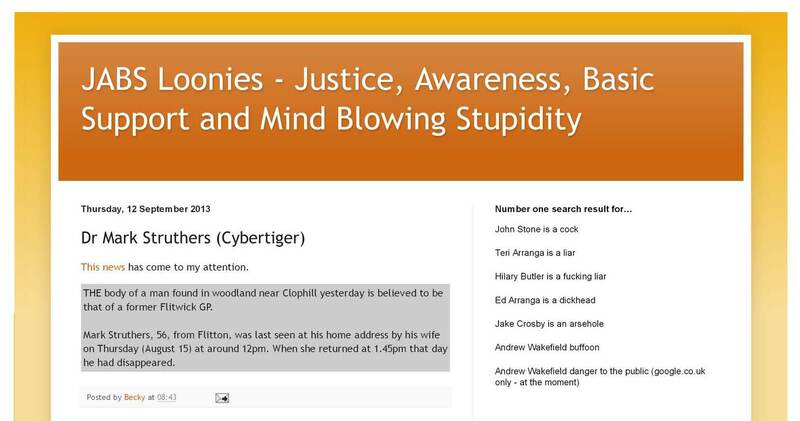 In life Dr Struthers tried to take them on by challenging them online, posting comments on blogs as “Cybertiger“. Their response routinely was to gang up in hordes to attack abuse and disparage him personally. Dr Mark Struthers was a gentle man and doctor who was well aware of the hazards vaccines present to children, the serious limitations of their alleged benefits and the concerted behaviours of too many in the medical profession to fail to report on and thereby to suppress their too often serious adverse effects particularly on children. It concerned him greatly. Though Mark was prone to depression and without doubt the more so with the behaviour of Dr Ben Goldacre’s hordes, Dr Ben Goldacre is all the more culpable and not less. If you pick on a victim you have to accept the victim as you find him, with all the human fallibility and weakness he may have. One of what appears the favorite approaches to bullying and abuse is to “out” their victims by trying to determine their identity and then publishing the full name along with personal details which they then use to engage in their attacks. That is what they often did to Mark and it obviously was going to and did cause considerable harm and distress to him particularly in his professional career. Those of Dr Ben Goldacre’s associates on his BadScience forum involved appeared to gloat about the death, posting a notice of the announcement of the press report on one of the numerous anonymous free blogs they use to engage like low cowards in these kinds of attacks. The author of the blog is a grown Englishman of mature years who pretends to be a woman whilst engaging in abuse of others on the internet in sexually explicit terms. [Impersonation is not unknown like another of his BadScience associates who for years adopted the persona, image and language of a five year old boy until pointed out on Twitter but he now appears to have reverted again to type.] The abusive Englishman set up the blog after being blocked from the forum of a self-help group for parents of vaccine injured children, JABS, following years of relentless trolling and harassing of forum members. Clearly a man with issues. 5: Linking to or exposing the real life identity of a forum member is not allowed. Listen, a lot of harm can come from having your true identity associated with your online pseudonym or handle. While a lot of people do use their real name or well known pseudonyms as forum handles, I do not recommend this. Moreover, I do not think that purposely exposing someone’s real life identity is something that we should allow here on BS forums. The moderation team agrees, and therefore the rule change is hereby effective immediately. There is no evidence Dr Goldacre engaged in bullying Mark or that he engages in anonymous bulling and abuse activities like those of some of his forum members. The BadScience forum is more like a means of bullying-by-proxy. That is like letting others do the dirty work to look innocent and to maintain a kind of credible deniability of responsibility and blame. A move further in the direction of credible deniability may have been the removal by Dr Goldacre of the prominent link from his Badscience.net blog to the BadScience forum. That appears to have occurred after the events described in this CHS post: Dr Ben Goldacre’s Grovelling Apology For Sexual Abuse, Bullying & Harassment of Female Doctor & Medical Journalist By His BadScience Forum Trolls and Bullies. Sigh. Do not abuse Jeni Barnett personally February 11th, 2009 by Ben Goldacre. Ironically a point radio presenter Jeni Barnett was making was that she did not know much about issues of vaccines causing autistic conditions but that there seemed to be a lot of bullying going on about it. In May 2014 Dr Ben Goldacre had been the subject of what seemed sound valid criticism of his activities posted on the blog of an eminent expert Professor of medicine with considerable expertise and experience in drug safety issues. As you can see here, Goldacre’s response was abuse and bullying, using his Twitter followers to join in.